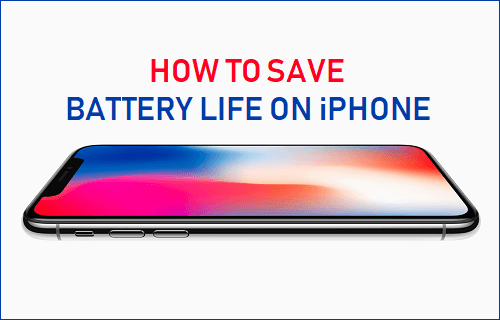 Depending on how you use your iPhone, the tips to save battery life on iPhone as provided below should help you extend the battery life of your iPhone by a few days or at least make your iPhone easily last for the entire day. The default settings on iPhone are geared towards providing users with access to all the features on iPhone, which you may or may not require. Hence, most users are in a position to save battery life on iPhone by turning OFF features that are not important to them. Also, when it becomes necessary, most non-essential features can be turned OFF to save more battery life. If you find your iPhone draining its battery quickly, even after following these tips, it is likely that the battery on your iPhone is close to the end of its useful life. In such cases, it is recommended that you take your iPhone to the Apple Store and get it tested. The Auto-lock feature on iPhone makes it automatically go to sleep after a certain period of inactivity. 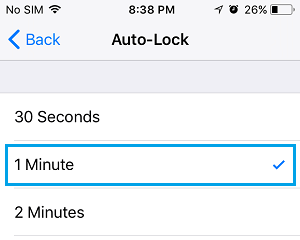 In order to save battery life on iPhone, you need to set the Auto-Lock period to a low level. 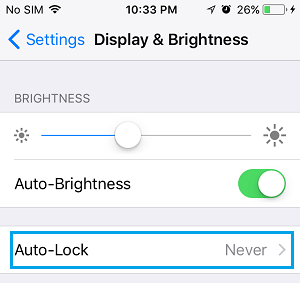 Tap on Settings > Display & Brightness > Auto-Lock. On the next screen, set Auto-Lock interval to 1 Minute. The brighter the display on your iPhone, the more battery it consumes. Hence, you can expect to save Battery Life on iPhone by turning down the brightness of the screen to its lowest possible level. 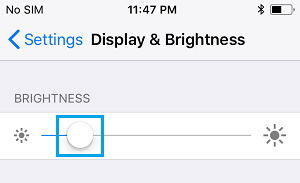 Tap on Settings > Display & Brightness. 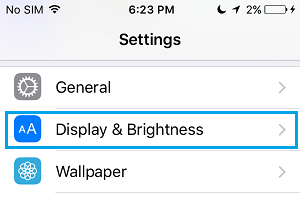 On the next screen, you can set brightness on your iPhone to its lowest possible level by dragging the Brightness slider to the left. Social Media Apps like Facebook, Twitter and others can use up battery life on your iPhone due to their compulsive tendency to refresh data in the background. Hence, consider disabling Background App refresh for all the unnecessary and unimportant apps on your iPhone. 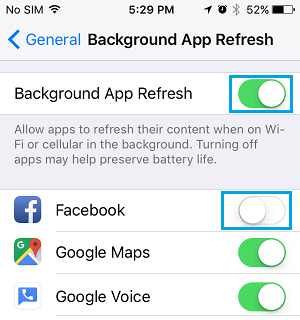 Tap on Settings > General > Background App Refresh. On the next screen, disable Background App Refresh for all the unnecessary Apps by moving the toggle next to the Apps to OFF position. 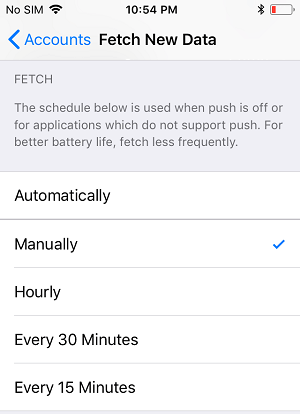 You can expect to save considerable battery life on iPhone by setting your iPhone to Manually Fetch Data. 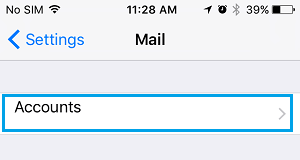 When this option is enabled, your iPhone will Fetch emails only when you open the Mail App. On the Accounts screen, tap on Fetch New data option and on the next screen, tap on Manually or on your preferred low Fetch Setting. If the Manual option does not suit your requirements, set your iPhone to fetch emails less frequently (Hourly). The significant Locations feature uses battery life as it is constantly tracking your location, in order to bring you personalized notifications based on locations that you most frequently visit. 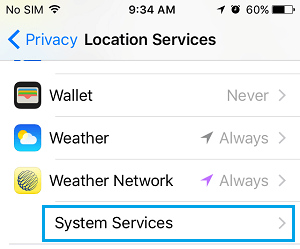 Tap on Settings > Privacy > Location Services > System Services. On the System Services screen, tap on Significant Locations. On the next screen, disable Significant Locations feature on iPhone by moving the toggle to OFF position. 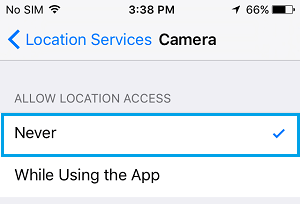 It is likely that Location Services is turned ON for most of the Apps on your iPhone. This forces your iPhone to constantly keep updating your location information, resulting in a loss of battery life. 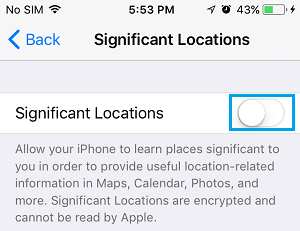 Hence, consider disabling Location Services for most of the Apps on your iPhone that do not need to use your Location information. 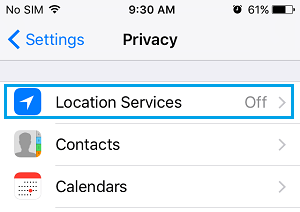 Tap on Settings > Privacy > Location Services. 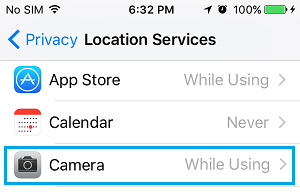 On the Location Services screen, you will see the Apps using your Location Data. Tap on the App for which you want to disable Location Services. On the next screen, tap on Never to disable Location Services for this App. Repeat above steps for all other Apps for which you want to disable Location Services on your iPhone. The Bluetooth feature on your iPhone uses battery life to search for nearby Bluetooth devices. 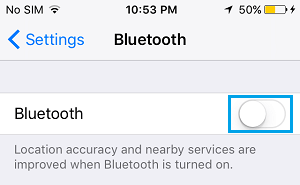 You can save battery life by disabling Bluetooth on your iPhone. Your iPhone is designed to constantly look out for WiFi networks and this uses the battery on your iPhone. Hence, turning OFF WiFi on your iPhone, while it is not being used can save battery life. 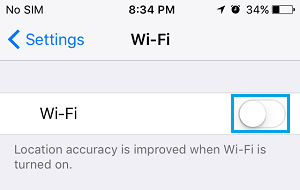 Tap on Settings > WiFi > on the WiFi Screen, disable WiFi by moving the toggle to OFF position. Alternatively, you can also disable WiFi by swiping up from the bottom of the screen and tapping on the WiFi icon. Note: Do not disable WiFi in case you have an Apple Watch. Many features on Apple Watch need WiFi to function. 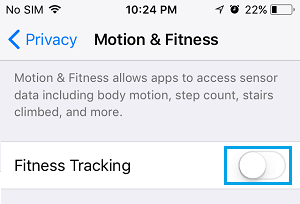 Tap on Settings > Privacy > Motion & Fitness. On the next screen, disable Fitness Tracking on your iPhone by moving the Toggle to OFF position. 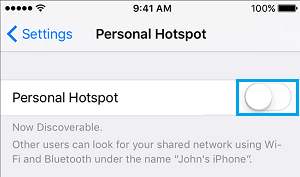 Tap on Settings > Personal Hotspot > on the next screen disable Personal Hotspot by moving the toggle to OFF position. The Vibrate feature on your iPhone is triggered by a motor that uses up battery life. 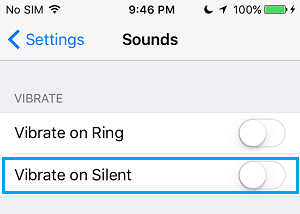 You can save battery life by disabling vibrations on your iPhone. When you move your iPhone, you will see that the App icons move slightly while the background remains stationary. Your iPhone uses battery life in order to produce this parallax effect. 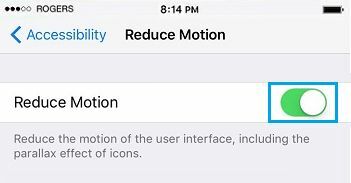 Tap on Settings > General > Accessibility > Reduce Motion. On the next screen, enable the option for Reduce Motion by moving the toggle to ON position. The Equalizer feature on iPhone can increase bass, decrease treble and make adjustments on the fly. However, these adjustments use battery life. 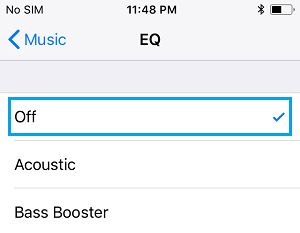 Tap on Settings > Music > EQ. On the EQ screen, tap on the OFF option. You can save battery life on iPhone by turning OFF My Photo Stream which automatically uploads new photos to all your iCloud devices. Tap on Settings > Photos > On the Photos screen, disable My Photo Stream by moving the slider to OFF position. The AirDrop feature takes up battery life as it is constantly busy looking for other AirDrop-Enabled devices around you. 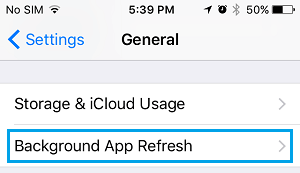 You can save iPhone Battery Life by disabling the AirDrop option on iPhone, whenever it is not being used. In the expanded Network Widget, tap on AirDrop. 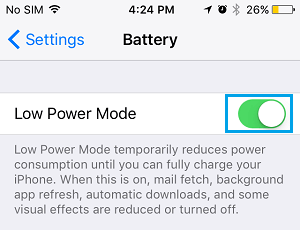 The easiest way to conserve or save battery life on iPhone is to manually enable Low Power Mode. This can be done whenever you feel that your iPhone is not going to last through the day. Tap on Settings > Battery > On the next screen, move the Low Power Mode slider to ON Position. Note: Only the most essential features and services will be working on your iPhone during Low Power Mode. You can go for this option, only when you are in a desperate need to save battery life on your iPhone. 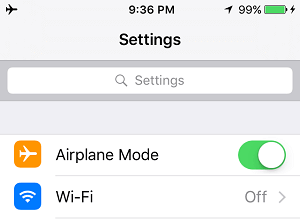 When your iPhone is placed in Airplane Mode, all incoming Phone calls, SMS Messages, Radio, WiFi, and Bluetooth will be disabled on your iPhone.